Above: This 1507 edition of Ptolemy's "Geographical Guidance" was accompanied by Johannes Ruysch's map of the world. Image drawn from here. For previous posts in this story of African adventure, see here and here. Tommy disembarking at JRO. Passengers make their way on foot from stairs pushed against the plane to the airport terminal. A line forms outside the door where immigration and security officials await. I wave goodbye to my honeymooning friends. Their journey continues to a Tanzanian beach on the Indian Ocean. Our journey, once through the airport terminal, angles up a mountain hidden in the clouds. How appropriate! I think. The earliest mentions of Kilimanjaro are shrouded by the mist of time. It is possible that the first mention of the great mountain is in the record of Claudius Ptolemy (AD 90-168). His treatise on world geography, sometimes titled "Geographical Guidance," was likely written from Alexandria, Egypt, during the middle of the second century AD. It leaned on the lost work of Marinus of Tyre (whom Ptolemy both admires and criticizes) as well as upon data, lists, and coordinates obtained from other travelers and traders. "Geographical Guidance" presents a discussion of contemporary (read "second century") map-making principles followed by a gazetteer of some 8,000 localities! Used with caution (it may have been amended after Ptolemy's lifetime), it is a stunning source for understanding the shape of the Roman world in the post-New Testament era. Unfortunately, no early manuscripts of this eight volume work exist. What we possess are more than 40 copies of copies of copies (!) and lots of piecemeal fragments. None are earlier than the 11th c AD. 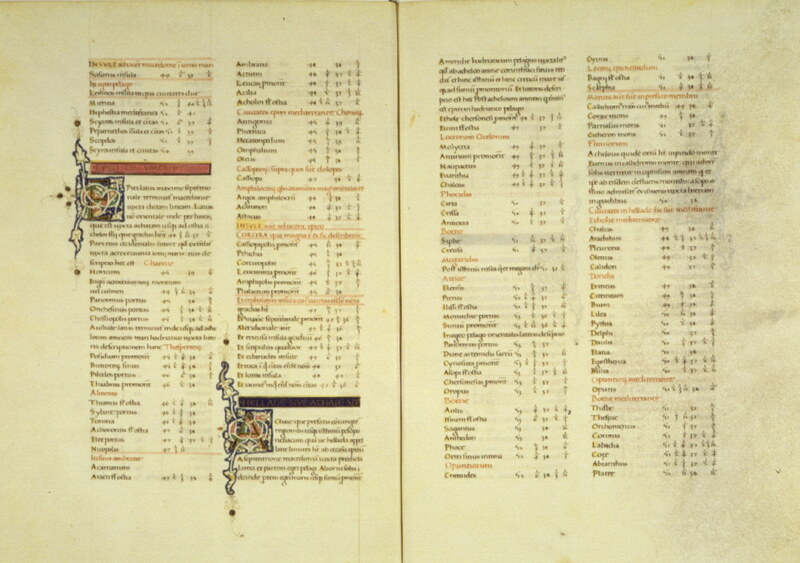 Two pages of Ptolemy's Geographical Guidance translated into Latin by Jacopo d'Angelo da Scarperia, ca. 1470. Image available here. Two elements drawn from Ptolemy's discussion of Africa are relevant to the present situation. The first concerns an ancient "metropolis," the second, a range of mountains (I'll spread this across two posts). In either case, one picks up a vibe akin to the feeling of tiptoeing blindfolded out of one's tent at midnight along an icy ridge in a midst of a snowsquall. In Book IV, Ptolemy describes the continent of Africa. Chapter by chapter he works his way from the known to the unknown so that by the end (Chapter VIII), the reader finds him/her-self teetering on the edge of modern sensibilities "where elephants are born entirely white, and rhinoceroses and tigers." Here is a barbarian land in its classic sense--complete with cannibals--stretching as far as "the Barbaricus bay." Featured is a promontory, a river, and an emporium associated with the name Rhapta. It all rests in the mysterious land of Azania* at the tail-end of western knowledge. But stunningly, it also rests at the nose-end of something else. Something big and far-reaching. Ptolemy calls Rhapta a "metropolis." Now the careful reader recognizes that this is not the first appearance of Rhapta in Ptolemy's work. Neither is it the first mention of Rhapta in classical sources. ** Previously, Ptolemy tells the story of a certain Diogenes who was once blown off course on the way back from India. For the geographer, this becomes a fuss with Marinus over measures and compressions of latitude. For us, however, it is a snippet of what must have originally been a thrilling travel account. After coming ashore (for reasons unknown) Diogenes traveled 25 days overland into Africa until he reached "the lake from which the Nile flows, to the south of which lies the promontory of Rhaptum" (Book 1, Chapt IX). Map of places associated with the Indian Ocean in the Roman Period. This image may be found here. Such texts electrified Victorian explorers like Burton and Speke who eagerly sought the source of the Nile in the literature and on the ground. One doesn't have to work too hard to find lengthy discussions of Ptolemaic puzzles in 19th c British publications. Much more recently, Tanzanian archaeologist Felix Chami has proposed that the lost city of Rhapta is to be found buried beneath the sediment of the Rufiji River delta, southwest of Dar es-Salaam. See a fascinating link here (Anybody want to go help Dr. Chami find Rhapta?)! Ptolemy's mention of this now-lost entrepôt leads us from one puzzle to another. And this brings Kilimanjaro back into view. Using the Rhaptum promontory as a pivot point, Ptolemy turns to inner Africa. To the west "are the Mountains of the Moon from which the lakes of the Nile receive snow water; they are located at the extreme limits of the Mountains of the Moon" (Book 4, Chapt 8). Such a reference sends a shiver up the spine! It also gives us reason to pause. The reasons why will be taken up in a future post. A dhow sails along the East African coast. Image from here. *Some moderns have identified ancient Azania with the region of South Africa. This represents a shift from the original location of Azania located on the Eastern shore of Africa between Somaliland and Tanzania. "Two days' sail beyond, there lies the very last market-town of the continent of Azania, which is called Rhapta; which has its name from the sewed boats (rhapton ploiarion) already mentioned; in which there is ivory in great quantity, and tortoise-shell. Along this coast live men of piratical habits, very great in stature, and under separate chiefs for each place." This depiction of a rhinoceros adorns the Hellenistic era Tomb of Apollophanaes at the site of Beth Guvrin (Eleuthropolis) in Israel-Palestine. It is unlikely that the artist ever saw a rhino with his own eyes, but I think he did a lovely job, don't you?